Commonwealth was founded in 1957 by Charles E. Merrill, Jr., who served as headmaster until 1981. He chose to locate the School in Boston's Back Bay because, as he put it, “one goal of Commonwealth is to restore good secondary schooling to the city,” recognizing that Boston would be a “stimulating and realistic” setting for education. He purchased two adjoining brownstones on the corner of Commonwealth Ave. and Dartmouth St., which had previously housed the Katherine Gibbs School, and set to renovating and furnishing them. In the fall of 1958, Mr. Merrill welcomed the School's first students: 8th graders, as the school at first began a grade earlier than it does today. The School has developed a remarkable culture, at once intense and supportive. Teacher's office doors are always open, every voice counts in discussion-based classes, and students take pride in the School's energy, humor, and cohesion because so much of it is their own. Besides instilling discipline and independence of mind, Mr. Merrill hoped to encourage Commonwealth students to be “decent, socially responsible, generous people,” actively engaged in public affairs. Commonwealth graduates frequently choose careers that enable them to make a difference in the world: they practice medicine abroad and at home; teach in public schools, prep schools, community colleges, and major universities; work as lawyers, neighborhood organizers, computer consultants, and business leaders; and pursue careers in the arts, television and film, and politics. Horatio Hollis Hunnewell made his fortune in railroads and the development of the West. Born in Watertown, he was sent to Paris at the age of 15 to learn banking at the firm of Welles and Company. He married Isabella Welles, the daughter of one of the firm’s partners, and the couple returned to Boston, settling in a Beacon Hill townhouse. In 1852, the couple moved to a country estate (named Wellesley in honor of Mrs. Hunnewell) on the shores of Lake Waban, 12 miles from the city. In the following decades, Hunnewell acquired much of the surrounding property, where seven of the couple’s nine children eventually built their own estates; the properties are now managed as the Hunnewell Estates Historic District. The Hunnewell families would often spend spring and fall in Wellesley, summer at Buzzards Bay, and spend the winter in Boston. H.H. Hunnewell set about providing city homes for his children. 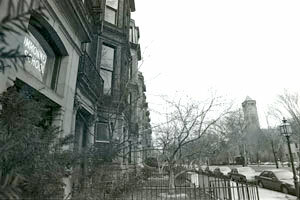 In 1876, he bought two undeveloped lots in the newly-filled Back Bay, one for his daughter Isabella and her husband, Robert Gould Shaw (cousin of the Civil War officer), and the other for his son Arthur and his wife, Jane. Isabella received the land that became 151 Commonwealth Ave.; 303 Dartmouth St. went to Arthur. The 1881 Clark’s Boston Blue Book, a society directory, lists R.G. Shaw at 151 Commonwealth Ave. In 1917, Isabelle Shaw sold the home to J. Sumner Draper and Mark Temple Dowling, who resold it to architect Arthur Little and his wife, Jessie. The new owners promptly remodeled; the front entrance was most likely lowered to street level as part of the project. By 1920 Rodman Paul Snelling and his wife, Eva, owned the property. In 1925, the Katherine Gibbs School purchased the building for use as classrooms and a dormitory. With only a brief hiatus, Jane and Arthur Hunnewell lived at 303 Dartmouth St. for the rest of their lives. Arthur died in 1904. His brother in law, Robert Boit, later wrote that “Arthur Hunnewell was a splendidly ‘set-up’ man and always dressed with great taste and care. He was strong and fearless and almost fierce-looking, but with the kindest of hearts and gentlest of natures—admired and feared by those who did not know him; admired and loved by those who did.” Jane Boit Hunnewell died in 1930. When the Gibbs School purchased her home in 1931, it was also converted to classrooms and a dormitory. In 1935, the Katherine Gibbs School cut doorways between the two buildings, joining them. The school also owned the Shaw house’s other neighbor, 135 Commonwealth Ave., and opened doorways into it as well. The Gibbs School moved out of the buildings in the 1950s. Charles Merrill purchased the two corner buildings in 1955; he later regretted not purchasing 135 Commonwealth Ave. In January 1956, the city approved his plans to consolidate the buildings, and to replace a 1902 addition at the rear with a larger addition, to be used as a gym and dining hall. The floor plan was modified somewhat over the school's first 50 years. Boys' and girls' locker rooms were removed from the basement and replaced with an annex to the gym, updated restrooms, and a classroom. The gym itself was renovated in 1996. As enrollment grew, some study rooms and classrooms were converted to faculty offices. On the fifth floor, a new photography and printmaking studio replaced the dance studio in the mid-2000s. In 2015, the school began an $8 million renovation affecting every area of the school, including upgrades to the biology and chemistry classrooms, construction of a new stairway from the first floor to the lower level, expansion of food service areas on the lower level, an entire reworking of the lower level floor plan to improve teaching spaces and traffic flow, installation of new, energy-efficient windows, installation of the school’s first-ever comprehensive heating and cooling system, based on high-efficiency heat exchange units, and construction of an elevator in the former air shaft between the two buildings. Charles Merrill founded Commonwealth in 1957 and served as its headmaster until his retirement in 1981. His history of the School's first twenty-three years, The Walled Garden, is published by the Rowan Tree Press. Our sports teams are Mermaids because Mr. Merrill chose the Mermaid of Warsaw, which acquired special significance as the symbol of Polish resistance to German occupation during World War II, as the School's emblem in hopes that it would stand as a call to conscience and action. Chairman of the Board of Trustees at Morehouse College in Atlanta for fifteen years, Mr. Merrill was well known for supporting the education of African-Americans. He was a trustee at Hampshire and Marlboro Colleges, and taught at Spelman, Guilford, Warren Wilson, and Moravian Colleges. 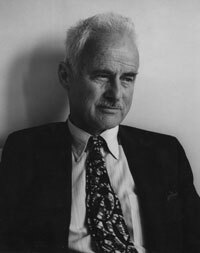 Remembering Charles E. Merrill, Jr.
"These men and women had an intense conviction of the value of WII—to stand up to the Germans, who had wanted to wipe out the city, and to the Russians, who had seen it as a docile provincial capital within the Soviet Union. One held to a faith in human spirit when there was little else to hold. Accordingly, I chose the Warsaw mermaid as my school's symbol." Ever since, the mermaid has served as our emblem and logo, representing the strength of hope and spirit along with Commonwealth's willingness to be different when there's a good reason. From in-school announcements to varsity athletic events, we are proud to call ourselves mermaids. Farhad Riahi was one of Commonwealth's legends. A renowned scientist and university leader in his native Iran, he was forced to leave the country following the 1979 revolution. He settled in Boston, and Commonwealth was fortunate to have him as a physics and math teacher from 1990 until his retirement in 2010. He passed away peacefully in August 2011, after a month-long struggle with Acute Respiratory Distress Syndrome. A month later, hundreds of friends, family, and former students and parents filled the First Church in Boston for a celebration of Farhad's life. With a Ph.D. in theoretical physics from the Swiss Federal Institute of Technology, Zurich, Farhad returned home to Iran to serve as Academic Vice President of Sharif University of Technology (formerly Aryamehr University) in Tehran, and was then named President of Bu-Ali Sina University in Hamadan. Following the 1979 revolution, he emigrated with his family to Boston, where a friendship with Ellen Cole and her husband, Gene Saletan, led him to Commonwealth. Farhad immeasurably influenced a generation of Commonwealth students. His brilliance, courtliness, humor, and modesty made one feel honored to call him a colleague. All who knew him loved this extraordinary teacher and man. Farhad Riahi is survived by his beloved wife, Suzan, his children, Shervin, Nazhin, and Shahrzad, and his sisters Mahvash and Mahnaz. Mr. Davis retired in June 2013 after teaching for 41 years at Commonwealth. Best known as an English teacher, Mr. Davis also taught Bible and a variety of electives: Intellectual History, Poetry, Disquieting Fiction, Folktales, and African Literature. As he neared the end of his tenure, tributes poured in from grateful students and colleagues near and far; we presented them to Eric at the 2013 graduation. In May, at the 2013 Art Show Opening and Parent Reception, Eric shared stories and thoughts on his years at the school. In the early years of the School, Mr. Merrill began Commonwealth's most durable and beloved tradition. Twice a year, every student and faculty member traveled to the Merrill farm near Hancock, NH. On buses and in cars, they brought everything they would need: food, pots and pans, sports equipment, sleeping bags. Students, with teachers' help, planned, cooked, and cleaned up for every meal. Movies, a talent show, or a dance were evening entertainment, and at night students and their faculty chaperones slept on piles of hay in the farm's two barns. By the late 1990s, the aging Merrill farm could no longer support these Hancock weekends. After a long search, "Hancock" moved to Camp Winona in Maine. 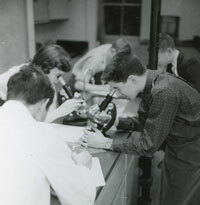 Many of the old ways remain, including the close cooperation among students and faculty.